Includes a Plastic Wall Clip Holder (mounting screws not included). Universal,… Fits RV’s, Homes, Boats, and Roll Shutters. Both Handles Spin on the pole for easy twisting, for opening or closing the Awning. 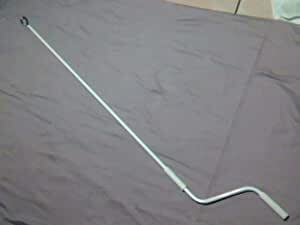 Dimensions; It is 5 Feet long (60″), the Plastic Coated Metal Bar is 1/2″.